Really Helps me enjoy my computer much better. I am extreemly sensetivee to any kind of glare. When I received my computer I was really dissappointed with the glare on the screen. Your maxi glare film has really made a huge difference. I do wish the holes for the buttons on the screen were circles instead of noches. I'd held off on buying a screen protector for my tablet repeatedly; I always had doubts about how it would work. I finally got fed up with writing carefully/slowly with a stylus and decided to do a little more research. The friendly folks at tabletpcreview.com's forums seemed to recommend Photodon the most frequently, so I went ahead with an order. Shipping was fairly fast, application of the protector -- though always a little bit of a headache with any screen protector -- went as easily as it possibly could've. The film didn't fit precisely every square millimeter of the tablet, but I couldn't have expected better quality. It IS anti-glare, it feels safe and comfortable and natural, as if it came with the tablet, and -- believe it or not -- it really does feel more like paper when writing with the Wacom stylus! Very fast shipping, very easy to apply. Unfortunately, it is not as good as SGP AG which I had on my previous tablet. That one has better texture for writing and more higher level of anti-glare but this was expected based on the published specs for each one of them. I had previously installed the ZAGG product, but it actually increased glare, was prone to scratches, and was sticky when using the stylus. Other than the fact that I could have used an extra pair of hands installing on the large tablet, the installation was easy and bubble-free. The protection is great, glare has been reduced and the feel of it is very smooth. Note: the gloves in the installation kit were very helpful. 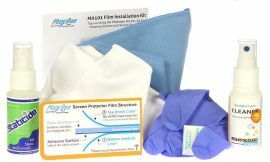 However, if you have gloves and some kind of cleaning solution, the cloth that comes with the film is sufficient forminstallation. Fast shipping, FITS PERFECTLY, feels like paper when using the stylus. This is the best screen protector available for the series 7 slate. Two thumbs way, way, up!